In Getting Started: As a Poweruser, we created a virtual environment from scratch that can be shared with other users. Here, we show how you can completely specify your own environment. Knowledge of Ansible is needed, which can be gleaned from their excellent documentation at http://docs.ansible.com/ansible/. This graph shows the operations involved in the build and run processes for virtual machines. Input Environment Box File -> Initial Virtual Machine: The input environment is a virtual environment containing only the operating system and few convenience tools. In development, Vagrant and VirtualBox create a virtual machine from this environment in the create_vm role (see Build and Run). 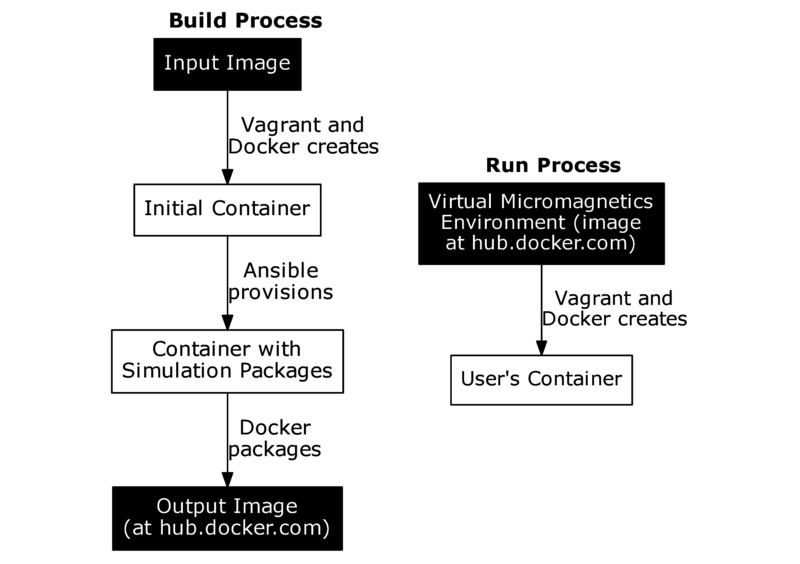 Initial Virtual Machine -> Virtual Machine with Simulation Packages: Vagrant commands Ansible to provision this machine using an Ansible playbook. 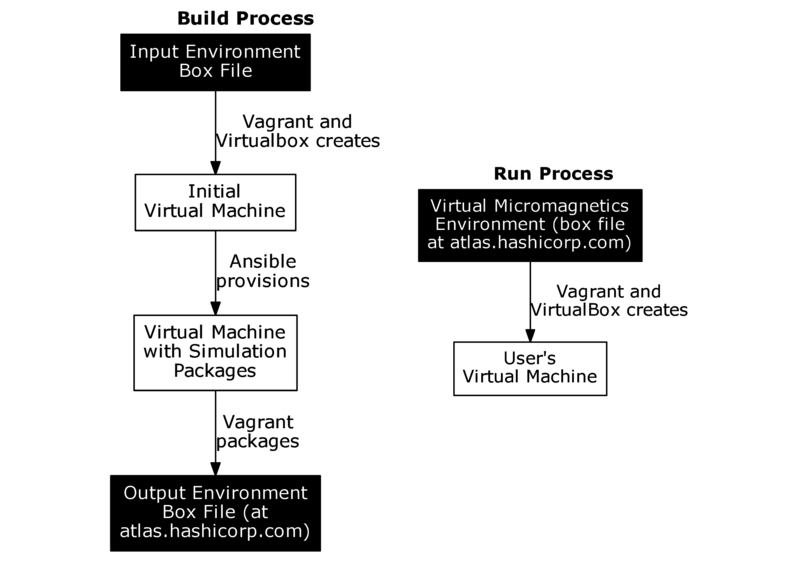 Virtual Machine with Simulation Packages -> Output Environment Box File: Vagrant then packages the virtual machine into a new virtual environment, which can be distributed to others. Tagged releases are uploaded by administrators to atlas.hashicorp.com, where they become available to all Vagrant users. In the same way, this graph shows the operations involved in the build and run processes for containers. Again the process of creating and running a container as a user is as simple as following the instructions in Getting Started: As a User. The build process is also similar; a container template (image) is downloaded, a container is created and provisioned, and the container is packaged as an image for download by all Docker users. The key difference is that Docker pushes the image to https://hub.docker.com/ as opposed to Vagrant. The build (make) process in step 3 in Getting Started: As a Poweruser allowed us to create a virtual environment. The Makefile in the software repository can build multiple targets. Each target runs Ansible on the master.yml playbook, which in turn runs the create_vm or create_container role in the roles directory. This creates a virtual machine or container and provisions it with the playbook passed as a command-line argument in Makefile, which lives in the jobs directory. It will also do some post-provisioning tasks using the hookbook, again passed as a command-line argument. The fundamental difference between the playbook and the hookbook is that the playbook is run on the guest virtual machine by Vagrant, and the hookbook is run on the host machine. Different Makefile targets may place different build artefacts in the artefacts directory. Roles add or configure software, playbooks describe the roles that must be enacted to provision the machine, hookbooks describe what to do with that machine (like creating a box file), and jobs are Makefile targets that produce certain machines. To add a new environment, one needs to add a job that follows the pattern of existing jobs. Makefile: This is the Makefile through which all jobs are conducted. ansible.cfg and inventory.txt: These files are used by Ansible when the master.yml playbook is run. They contain configuration information. jobs/: This directory contains playbooks and directories that can be thought of as jobs in Makefile. They are either provisioning playbooks, or post-provisioning hookbooks. artefacts/: This directory is created by Makefile, and houses build artefacts. ansible-playbook master.yml -c local -i localhost, -v -k --extra-vars="type=vm vm_name=virtualmicromagnetics-doc-example playbook=provision_virtualmicromagnetics_doc-example.yml hookbook=hook_vm.yml extra_resources_dir=guest_resources/"
# simulation with Fidimag. It is executed by the virtual machine. This creates another virtual environment in the artefacts directory. # Create a role for Emacs. # This Ansible playbook installs Emacs. ansible-playbook master.yml -c local -i localhost, -v -k --extra-vars="type=container container_name=doc-example playbook=provision_virtualmicromagnetics_doc-example.yml hookbook=hook_container.yml extra_resources_dir=guest_resources/"
The value of “type” is now “container”, not “vm”. The value of “hookbook” is now “hook_container.yml”, not “hook_vm.yml”. We have explored how a new virtual environment can be created, and how new software can be added. In this section, we describe how the virtual machine itself can be configured using Vagrant’s parameters. Vagrantfiles are files used by Vagrant written using Ruby syntax. These files specify parameters of the virtual machine created from a virtual environment. When running the commands in Getting Started: As a User, we create a Vagrantfile in the working directory that describes the virtual machine to Vagrant. Vagrantfiles can also be built into a virtual environment. Built-in Vagrantfiles can be found in guest_resources/vagrantfiles. This Vagrantfile will be detected by the hookbook and included automatically when the environment is packaged. For more information on Vagrantfiles, see the Vagrant documentation (https://www.vagrantup.com/docs/vagrantfile/). Note that this is not such a good idea if you want to distribute your environment to different users, since they may have a different amount of available memory to you. To summarise, virtual environments are created from an empty Ubuntu virtual machine after being provisioned and packaged. This build process allows the user to create a Virtual Micromagnetics virtual machine using Vagrant and VirtualBox. A similar approach is used to create images for Docker containers. We have also presented how a new environment can be created, how the software of that environment can be controlled, and how the virtual machines can be parameterised. Thank you for using Virtual Micromagnetics! If you create roles for your favourite software, consider sharing them with the community. You can create a pull request at our GitHub repository at https://github.com/computationalmodelling/virtualmicromagnetics, or contacting Mark at mark[dot]vousden[at]soton[dot]ac[dot]uk.